Nails 4 Dummies! : Cheeky Cupcakes! Hey happy, lovely people! 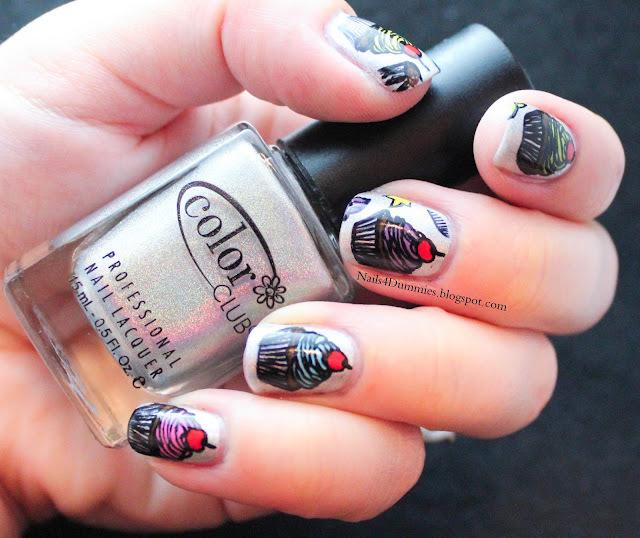 I have my favorite mani to date to share with you today! I'm obsessed with everything cupcake. 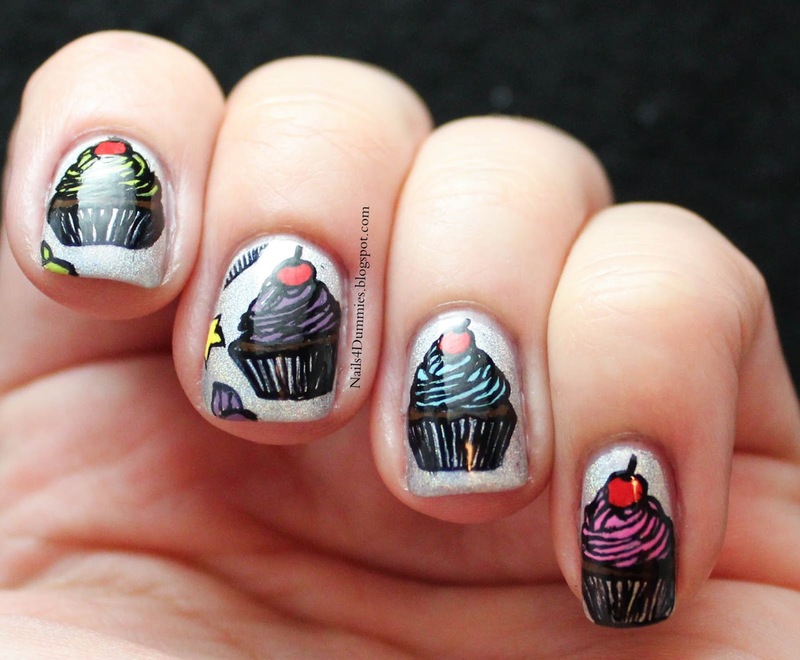 From nailart to eating them to having them on my kids clothes, whatever it is, I want it! I ordered 3 of the new Cheeky jumbo plates on Amazon and let me tell you - they are AWESOME!!!! I got # 7, 8 and 9 even though I want them all, I went with these first because they were my favorites. I think you will be seeing a lot of stamping on this blog for a while. For this particular mani, I painted on a base coat of Color Club - Harp On It and stamped over that using Konad - Black Pearl. This particular image is from Cheeky Jumbo plate 7 - Home Sweet Home. I then used a TINY brush and acrylic paints to add the colored bits! This one took me quite a while but I loved the outcome so much that it was totally worth it. What do you think? I honestly never keep a mani on for longer than about 24 hours but this baby has been on my nails for 3 days now and that includes a day at the water park! There is only a tiny bit of tip wear so I could keep wearing it but I'm too excited to try out some of the other stamps so it's got to go. Don't forget to go enter my GIVEAWAY!!!!!! Lol, thank you very much! I spent a lot of time on these so I really appreciate the love! Such an awesome mani, I LOVE it! Uhm hello, what happened to the '4 Dummies' part of your blog? These are INSANE. I couldn't even stamp that crisp, let alone fill in the tiny parts with colour. Fantastic <3 I wouldn't haven taken them off either!